In the early 90’s I was absolutely fascinated by the demo and mod scenes. I found nothing more exciting and wonderful than the concept of creating animated, interactive art and professional, emotional music with an ordinary PC. After cruising local modem BBSes for a few years I decided to be proactive and try my hand at composing my own MOD music. With the kind help of Toronto local MOD tracker artist bObby, I learned to use the free ScreamTracker 3 program for MSDOS to arrange prerecorded digital audio instruments on a sort of hexadecimal staff from 00 to FF (0 to 256 64th notes arranged into four 3F  note bars). I’ve recorded a screencast of my second-ever song, Technophrenia, and uploaded it to YouTube. Take a quick look to see how the plotted notes correspond to the sounds produced. I’ve written nearly 2 hours worth of music over the course of over 4 years under the nom de plume (or is that nom de clavier?) Hypnotic Melody. If you’d like to hear more, check out my Brian’s MOD Music page. I wouldn’t dream of ever charging money for my music, so enjoy, share, DJ, remix, and republish (with my name) as you please. While submitting my URLs to be crawled by Alexa for inclusion on web.archive.org today I saw this ad on my Alexa Related Info page for my blog. I should totally buy this shirt. My girlfriend has a so-so digital camera. We are basically urban hermits so all we ever take pictures of are our cat Chrystal and the view out the window. 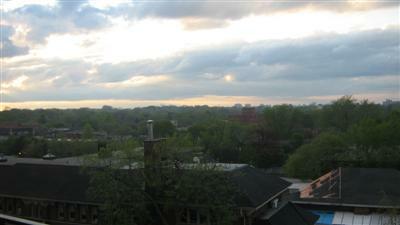 Here’s what I saw at 6:52PM from our apartment in uptown Toronto. This is my first time living in an apartment. The view is just unbelievable. I love that this is the most populous city (thus one of the most polluted) in Canada, yet the view from up here is predominantly green. This is the greatest nation on the face of the earth. If anyone else out there has a picture of the view outside your own home I’ll post it on my blog if you like.